The rankings in this meet are deceptive: California is the best team of the trio, though its ranking is depressed by a difficult meet last week. It won’t be unchallenged by its two visitors though. BYU has had an excellent start to the season, but both of its top scores have come at home. This meet is a great chance to change that. Arizona State didn’t seem overly vexed by the recent injury to Katelyn Lentz at home last week, but we’ll still be on underclassmen watch for the Sun Devils. For Cal, it hardly bears speculating on lineups since there have been so many mid-meet changes so far this year. I wouldn’t be shocked if Nina Schank loses her floor spot after a mistake last week, as much as I’d love for her to keep it. Past there, it seems to just be the Howells rolling the dice every meet to see what works. WHAT DOES THIS MEAN. They can’t stop playing with that 6 spot. Abi Solari is still in a boot and I hear Heather Udowitch is sick and will be out today. JONES – CAL: Well, she was rostered to go second so this is already fascinating. Okay full, slightly piked but basically stuck. HILL – BYU: BHS LOSO great, cat leap switch side I think, full turn really nice. BYU is in its best leotard, the royal blue to black ombre. Beat to kickover front. We’re going to have a LOT of partial routines here. I’ll do what I can. MASTRANGELO – CAL: Beautiful full, big and stretched, tiny hop back. CALLIS – ASU: Tkachev typically low, bail to toe shoot, some leg sep on the toe shoot but okay. Double lay straddled but stuck with her chest down. CLAUSI – CAL: Great one and a half, little hop forward. One of her better ones. MINER – BYU: I think this is her. Kickover front, arm swing before her BHS, might lose the connection. Good leap connection cartwheel gainer full stuck. 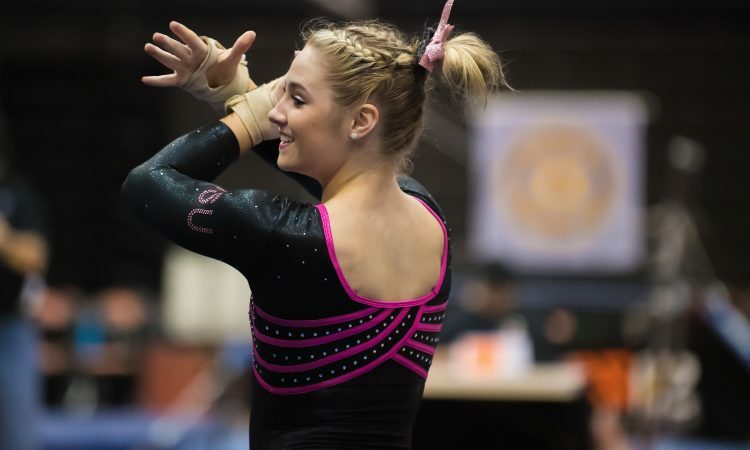 K. SZAFRANSKI – ASU: Just saw a little hop on her double back dismount. WILLIAMS – CAL: Huge full, lands with her weight a touch forward but holds the stick. Really nice! CYRENNE – BYU: Switch switch half, really nice positions, round off one and a half dismount stuck. Nice. WILSON – ASU: Blind to Jaeger, okay, not great form, bit short on her bail. GEORGE – CAL: Full is nice in the air, hop in place. WATTERSON – CAL: Ooh it is SNEAKY to put her in the anchor here. Beauty of a full, great block, twists quickly with plenty of time before and after. Big hop back but she’ll get it with time. BODEN – BYU: Kickover front BHS great, full turn, moving quickly. One and a half dismount stuck again. 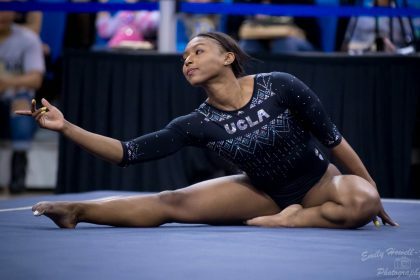 KUHM – ASU: Just saw her double lay dismount, gorgeous. Saw an ASU bars routine from I think Ginn in the exhibition…? I’m not really sure. MARSH – BYU: Front to back combo, we can see Milan Clausi drilling Tkachevs on a mat in the background. Full turn, switch double stag I think, gainer full comes in at an angle. EVANS – BYU: BHS LOSO, quick and aggressive, full turn, hitch kick kickover front with a lean. Switch straddle quarter, chest low but works through, gainer pike stuck-ish. Well, we got an odd selection of routines from that but it’s all good. Pretty solid start from everyone. BYU looked great, Cal could use some landing work but nothing devastating happened, I didn’t see enough of ASU to get a read but the score is excellent. Cal lineup change count is sitting at 1. SO. SEILNACHT – CAL: Blind to pike Jaeger, a bit messy, to overshoot. Blind to double full stuck. Really nice. KUHM – ASU: Just saw a dismount that looked good. GEORGE – CAL: Tkachev pretty but not huge, good bail, missed a handstand there, toe on to half in half out stuck! VITKAUSKAS – BYU: Her first two passes looked good, I already forgot what they were. Rudi to close nice and secure. WILSON – ASU: Cat leap switch half, stuck gainer full dismount. 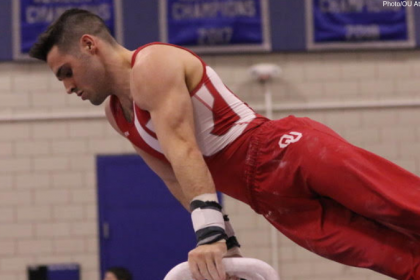 KUC – CAL: Maloney to Pak, really beautiful, gets cheers for a perfect pirouette on the low bar, shy on a handstand on HB, true full out with a hop back. WATTERSON – CAL: Pak, toe on to van Leeuwen really nice. Toe full, peels. Super weird. Skids forward on her knees, looks painful. Double back stuck. S. MINER – BYU: Double lay, beautiful, could have stuck it but chooses to lunge. Huge rebound on her double pike, OOB and I think touched a hand down. Tour jete half Popa, she looks really upset. 🙁 One and a half front lay solid. 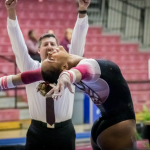 LEONARD-BAKER – ASU: Got her leap combo, BHS LOSO the usual, one and a half dismount stuck. SCHANK – CAL: Blind to pike Jaeger to overshoot is stunning. Nailed a handstand, double lay, college stick, her weight is back and she eventually steps out. CLAUSI – CAL: Full turn to Tkachev, bit low, bail is good. Shy on a handstand, double lay stuck. Fantastic debut for the freshman! Cal lineup change count at 2. A. SZAFRANSKI – ASU: Front aerial to Korbut. Switch split good, full turn, Rulfova comes in a bit low but not the worst I’ve seen for her. Looks like Bordas in the exhibition for Cal, huge double back to close with a little hop. PEARSON – BYU: One and a half front lay front pike. CALLIS – ASU: Front handspring down to one knee, hits it this time, side aerial back full with a hop. EVANS – BYU: The Super Mario routine! Double pike, hop forward but it wasn’t underrotated just mistimed. Double back great, nice control, tour jete half wolf full. Oh the DRAMA. Front lay front full is great. Jasmine Gutierrez looks good in the exhibition for ASU! Yas a freshman who’s alive. It’s SO CLOSE you guys. ASU is definitely getting the least video time, but what I saw looked super clean. It’s exciting to see Clausi on bars, I’m guessing she’ll make her debut in the all around today. CALLIS – ASU: Just under on her double pike, good two and a half. GEORGE – CAL: Double wolf a bit crunchy, front aerial BHS good. Looks uncertain on the landing but works through. Split LOSO, bend check, switch beat good. Gainer full, leans forward to hold the stick. KUHM – ASU: Whip double back, step forward. Two and a half is good. We keep cutting out of these routines halfway. CLAUSI – CAL: Switch switch is great, dances out, BHS LOSO beautiful. Fantastic choreography, full turn, beat side aerial back full STUCK. Fantastic routine. EVANS – BYU: Yurchenko arabian huge and STUCK. Absolutely fantastic. KEELEN – CAL: Full turn, BHS LOSO great. Split to split ring, front aerial, one and a half dismount with a hop to salute. SO. SEILNACHT – CAL: Walkover over the end of the beam, so pretty, full turn. BHS LOSO airy and great, switch double stag beat. Side aerial back full stuck, great. K. SZAFRANSKI – ASU: Double back, bit of a stumble out, one and a half front lay is beautiful. WILLIAMS – CAL: Punch front to LOSO, great, full turn a little wonky. Switch switch side, not much actual switch action, gainer pike stuck. GINN – ASU: Front thru double back, shuffle forward and a slightly low chest. BORDAS – CAL: She actually got to stay this time!! Switch switch, very tentative, BHS LOSO great. Front aerial, tiniest adjustment, full turn, side aerial great. Gainer full with one foot shifting. Yay! LEONARD-BAKER – ASU: Double back, little scoot. WE DON’T GET TO SEE ANY ASU ROUTINES TODAY. Shu in the exhibition for Cal. Tripodi in for ASU! YES get it ASU freshies. She is a spectacular dancer. Cal pulling away with the help of a PROGRAM RECORD beam rotation. We didn’t see enough of the other teams to really get a feel on them, but ASU looked okay with a few underrotations. SO. SEILNACHT – CAL: Front lay Rudi double stag. Great leaps, one and a half Barani to split. One and a half front lay good. Really solid lead off! K. SZAFRANSKI – ASU: Good full with a bit of a stagger back. GEORGE – CAL: Becomes the new #2! Front thru Rudi, big lunge out, switch ring tour jete 1/2 direct. Front double full is gorgeous, okay Rudi. WILSON – ASU: Okay full, slightly piked with a hop back. PITOU – BYU: Tkachev is way low. CLAUSI – CAL: Full in, really good. Something to wolf full, front double full and dances out, if they choose to call that a step it was a pretty big one. One and a half front lay is gorgeous. Should be a solid score in her AA debut! SOMEONE – BYU: Stuck a full out dismount on bars with a leg stagger. I want to say Boden. WILLIAMS – CAL: Switch side Popa. Front lay front full, okay, double pike with a big lunge. BORDAS – CAL: Double pike, rotates a bit slowly and lands a bit short. Nice leaps, Rudi, really high quality dance throughout here. One and a half front lay, bit of leg split but good landing. 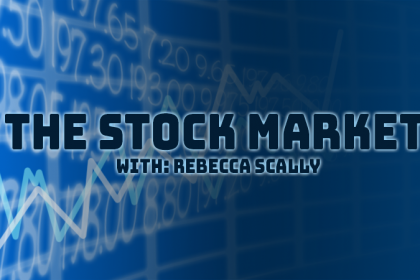 MASTRANGELO – CAL: Full in, I think this is the first week that’s made it into her routine. Few steps out. One and a half front lay, really controlled, switch side Popa is short on positions. Two and a half is fantastic. Looks like the Cougars had to count a fall on bars, which is disappointing. ASU wrapped up really well on vault. I think the Sun Devils are close to topping out on the current lineups’ potentials. I’d love to see them take a risk on the freshmen in a few weeks. Cal had a really promising night, though I’d really love it to pick some lineups and stick with them for at least the night. It can’t help the underclassmen’s mental game to be in and out all the time.